“I never thought I’d be saying this, but it’s retardedly salty!” commented my volunteer taster and boyfriend. This, coming from a guy who lives, breathes, heavily ingests and practically has salt blood sloshing through his veins, is rich indeed. To be honest, the saltiness was my fault entirely, not Mrs Beeton’s. 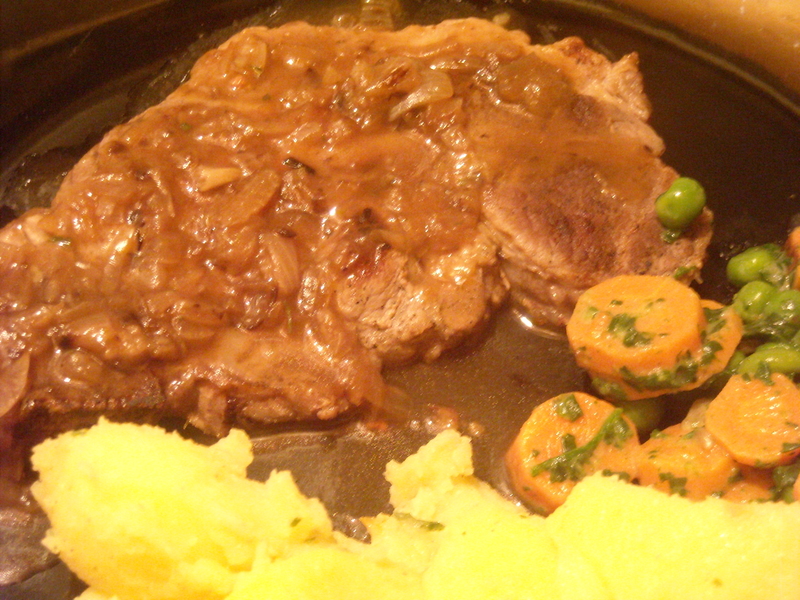 INGREDIENTS – 6 large onions, rather more than 1/2 pint of good gravy, 2 oz. of butter, salt and pepper to taste. As it’s just the two of us (excluding our three cats, who almost always seem to manage to get dinner table scraps off from my boyfriend), I usually reduce large-quantity recipes – in this case, by a third. Good gravy, I thought. Hmmm. Well, I have to say that my homemade (vegetarian) gravy is normally pretty good. 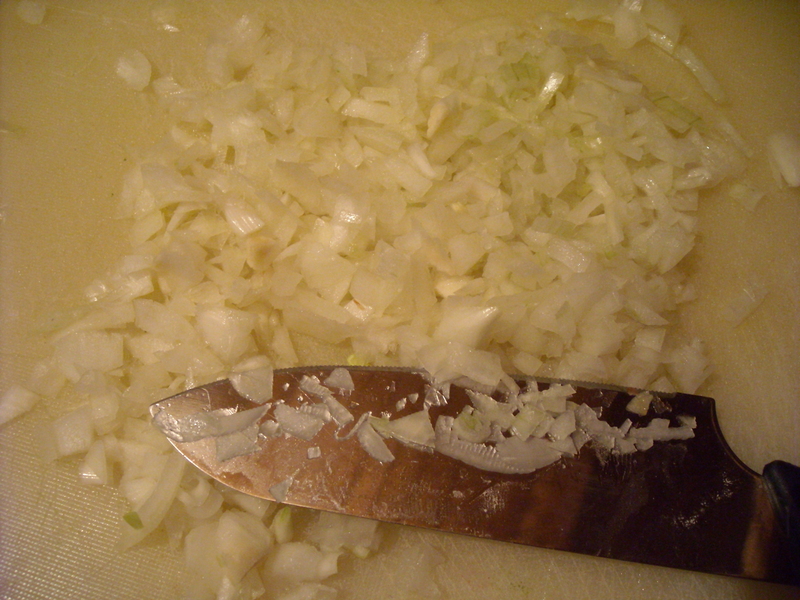 But, knowing that my boyfriend is not overly fond of onions, I was determined to flavour the gravy in such a way as to make both the fried onions and the sauce itself mightily appealing. Unfortunately, as it turns out, I put too much of a herb salt I’d just bought that day into the bowl. Or, rather, over-estimated how much herb salt would be needed to match the usual saltiness of plain old sea salt. We’d just had an argument about his attitude to trying new things, or, to be precise, anything new cooked by me. So, in the spirit of conciliation, I asked for his opinion about the gravy before finalising the sauce. The signs weren’t good when he raced to the sink and spat it out, before commenting on its saltiness. After watering it down somewhat, I put everything back on the stove for one final flick of the wooden spoon before spooning the sauce onto our plates. “It’s nice. Better. Oniony.” stammered my boyfriend, sensing my eyes unblinkingly focused on his lips in a non-sexual manner. The final result when making this sauce all depends, as I now know, on the quality of the gravy being used. Mrs Beeton states a very small quantity of gravy should be added, but I very soon realised that this is not very realistic (the sauce soon turns to nothing but a pile of onion). Let’s conservatively guestimate that I added approximately double the stated quantity, which still wasn’t enough but at least gave it the appearance of sauce. It’s a nice sauce. Just be careful with the gravy and you shouldn’t go too far wrong… unless you reach for the salt! This entry was posted on April 4, 2010 at 6:08 pm and is filed under food. You can follow any responses to this entry through the RSS 2.0 feed. You can leave a response, or trackback from your own site.